While re-sealing your natural stone flooring can count as do-it-yourself home maintenance, the initial installation and sealing is another story. Inside, sealing stone tiles offers protection against moisture or staining. But, it’s important outdoors, too. And, not just on flat surfaces. Stone on the outside of your house should still be sealed to help repel water. Why? Natural stone absorbs moisture. It’s constantly expanding and contracting depending upon the amount of water it soaks up. This expansion and contraction can stress the mortar joints over time. The result? Cracking or shifting of the joints. As with installations, a do-it-yourselfer should be able to handle sealing on smaller, inside natural stone projects. Outside, rely on your natural stone contractor to take care of sealing at time of installation. With high-quality sealers, the average application lasts three to five years. However, in high-traffic areas, you may need to reseal natural stone more often. One simple test? Put a drop of water on the stone. 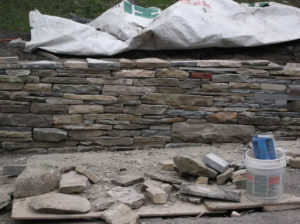 If it beads off, then your stone is sealed and does not need to be re-sealed at this time.